Undaria was produced globally through culture in 2004, with 2 196 070 mt coming from China alone. In nature, Undaria commonly grows in open seas or within bays on the temperate coasts of Japan, Korea, China, and other areas of the northwest Pacific which may have a rocky substrate. Usually, the frond grows to a length of 1-2 m.
Figure 7 (a-c) Methods for Undaria cultivation. (d) Undaria spore collector. The frame is 50 cm x 50 cm and synthetic seed string is wound around the frame. (e) Open water cultivation of Undaria. (a-c) Modified from Akiyama K and Kurogi M (1982) Cultivation of Undaria pinnatifida (Harvey) Suringar, the decrease in crops from natural plants following crop increase from cultivation. Bulletin of the Tohoku Regional Fisheries Research Laboratory 44: 91-100. 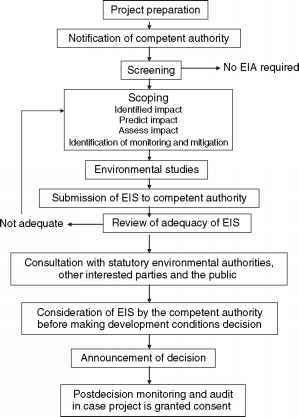 (e) Courtesy of E. Hwang. develop into male and female gametophytes. After ferti lization, the zygote develops into a sporophyte, thereby completing the life cycle. 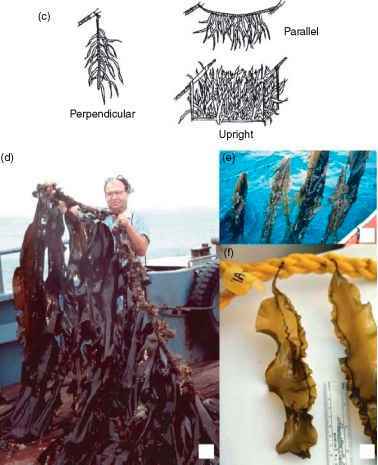 The cultivation of Undaria consists of four stages and is essentially identical to that of Laminaria (Figure 7). It consists of collection of zoos pores and seedlings, culture of gametophyte germlings, outgrowing of thalli, and the harvesting and processing of the thalli. The mature sporophylls are first partially dehydrated to induce release of zoospores and are then placed in culture tanks filled with seawater. Another seeding pro cess called the 'free living technique' uses vegetative gametophytes grown in flasks and is similar to the Laminaria rearing technology of clonal gametophyte tech nology. The seeded twine (usually 50 m of seed string) wrapped frames (Figure 7d) are removed from the seed ing tank and arranged vertically in a temperature controlled culture tank about 1 m deep. During summer and early autumn, the zoospores develop into microscopic gametophytes on the seeding frames that are wrapped with the twine. The germlings are allowed to develop to seedlings (2-3 cm) before removal and out planting along the open coast. The out planting of nursery grown seed lings starts in autumn when water temperature is about 20 °C. The original seeding ropes, which initially had seed string inserted within the braided rope, are cut into lengths of 4-6 cm (with approximately 10 seedlings each) and inserted into the twist of the main cultivation rope. 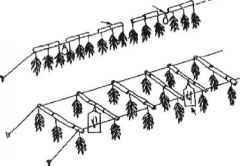 They are then set into the sea using rafts or long lines (Figures 7a-7c). Generally, Undaria reaches a harvestable size about 3-5 months after it is transferred to the sea when they reach a length of 0.5-1.0 m (Figure 7e). After the rope is hauled up from the sea on the boat, the cultivated thalli are cut from the rope with a sickle. Each harvested frond is approximately 5 kg in wet weight. The crop may be sold fresh, sun dried, or artificially dried.